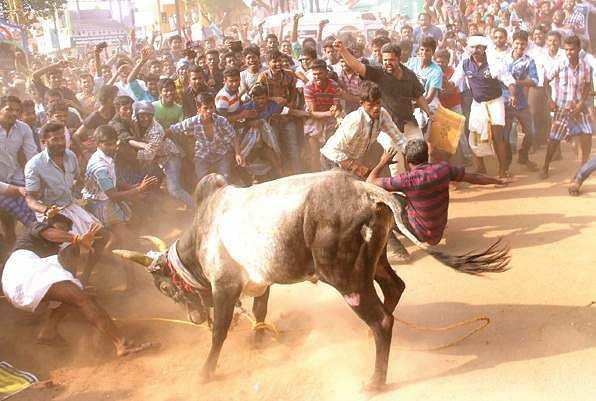 Despite Supreme Court ban, Jallikattu bulls were released in the grounds at Alanganallur in Madurai. 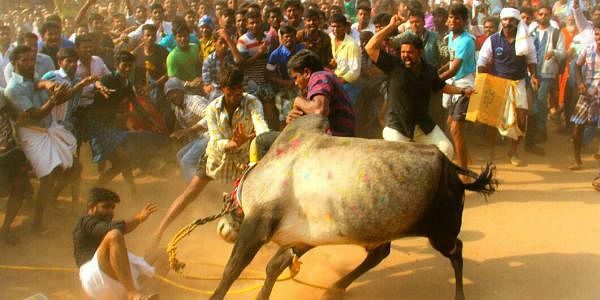 MADURAI: With this year’s celebrations coming to an end on Monday with Kaanum Pongal, Alanganallur that is famous all around the world for Jallikattu, lived up to its reputation and enthralled people, with young men testing their might against four bulls, despite the Supreme Court ban. On Monday morning, the organisers brought four temple bulls to the ground situated at the centre of the village. As per tradition, special poojas were performed for the decorated bulls. The villagers had taken up every vantage point to witness the ceremony.Then the bulls were released one by one. One of the bulls kept the tamers at bay for a good 15 minutes. Watching the action unfold, the villagers began cheering. Apart from the locals, hundreds of youngsters including college students and people working in the IT field from different parts of state also made an overnight stay at the village in order to extend their support for the sport. The youngsters along with the people of Alanganallur staged a protest condemning PETA for imposing a ban on Jallikattu by holding placards and raising slogans against the Central government for not taking steps to conduct Jallikattu. The people also went on a procession condemning the ban on Jallikattu. In the morning, music composer Hiphop Tamizha Aadhi came with the president of Jallikattu Peravai P Rajasekaran to extend his support and sang a song for the people and addressed the gathering. Later, veteran director Ameer also came to Alanganallur and extended his support. In the afternoon, a woman biker from Puducherry, Maheswarii Marimuthu who recently came to Madurai in her bike to create awareness about Jallikattu, also joined the protest. Speaking to Express, a youth from Madurai who is currently working in Saudi Arabia, B Karthik said that while he has not witnessed Jallikattu before, he knows the traditions behind the practice. He said that he availed one month's leave and came to Alanganallur to show his support for Jallikattu. Ten youth sustained injuries when the police resorted to lathicharge to clear a crowd of 1,000 from A Pudupatti.